This form of beadweaving is fun and easy to learn. Easy to follow step-by-step illustrated instructions for the basic gourd (also known as peyote) beadweaving stitch plus the decreasing instructions to close the top and bottoms both flat and curved. 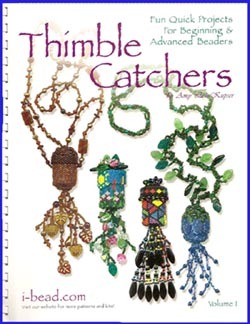 Quick start patterns for the body of the thimble catcher and tops are included.